Planting time will soon be upon many farmers across the northwestern United States, if it isn’t already. Every growing season there are countless things to consider – when to plant which seeds, where to plant, finding reliable sources of water and fertilizer, dealing with whatever weather nature decides to bring upon us – and, as always, pest control. Planning ahead and deterring pests before they have the opportunity to settle in is a solid practice. There are many different pests to consider, but the small, slimy kind definitely deserve some attention. Growers and researchers have hosted a “Slug Summit” at Oregon State University (OSU), acknowledging that slugs have grown as a problem in recent years. Some say the decline of field burning and the increase of reduced tillage farming has led to the growing population of these crop-munching mollusks. Others report persistent slug problems despite tilling and burning fields. Poison bait works sometimes – but one OSU researcher noted slugs that survive one commonly used chemical quickly develop an aversion to it. 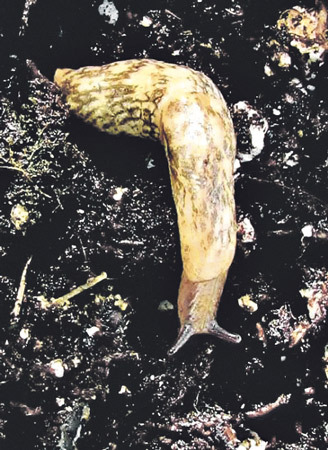 According to a report from Rory McDonnell, Nicole Anderson and Clare Sullivan in the Pacific Northwest Pest Management Handbooks, slugs are some of the most common and persistent pests of gardens and commercial crops in Oregon and Washington. Left unchecked, they can cause significant damage. They are active when the relative humidity nears 100 percent, the wind is low and the temperature rises above 38 degrees. They feed and reproduce during rainy and foggy weather – or after irrigation. “Be aware that supplemental irrigation, post-harvest residue buildup on soil surfaces and crop plant structures (e.g., closed canopy) can affect the microclimate of a crop and promote otherwise unexpected slug activity,” the report reads. Slug damage is discerned by the presence of slime trails and their small, sausage-shaped feces both on and around the damaged plants. Finding shallow to deep (from one-tenth of an inch to half-inch) smooth-sided pits less than half an inch in diameter can mean they are feeding on roots. Above ground, slugs tend to eat the plant tissue between its veins. Slug damage tends to be more extensive at the edges of fields, especially those with weedy, grassy or wooded borders. Large populations of the gray field slug – the species with the largest economic impact – and smaller numbers of less common species build up on all perennial legumes in western Oregon and Washington. Slugs mate in the autumn and the spring, producing small, round white or translucent eggs in clusters of a dozen or more in sheltered cavities near the soil surface or under moist debris on the surface. They can hatch in either season. In order to verify that slugs are present and in damaging numbers, growers can put out slug bait in the late afternoon, returning early the next morning to check for slugs or slime. Keep in mind slug baits are poisons and can be dangerous to children, pets and edible crops. Once you’ve determined slugs are the issue, the first step is to eliminate (as much as possible) all the places they hide – under boards, stones, debris, leafy branches growing close to the ground and dense ground covers, such as ivy. After that, you can use metaldehyde, iron phosphate and iron chelate (the most common chemicals in this field) to control their populations. Pest Management Handbooks stated that even when “good” control is achieved, only about 60 to 70 percent of the slug population may be removed. This usually suffices for economic crop protection if slug pressure is light, but it does allow the population to recover over time. Metaldehyde has been in use since the early 1940s, but be aware these baits are poisonous to dogs and cats. Do not use metaldehyde baits where children and pets could encounter them, and avoid getting metaldehyde bait on plants, especially vegetables. Iron phosphate has been in use since 1998 and iron chelate since the early 2000s – both safe for edible crops – and efforts are being made to find new chemical baits. Some iron phosphate products are currently approved for organic production. 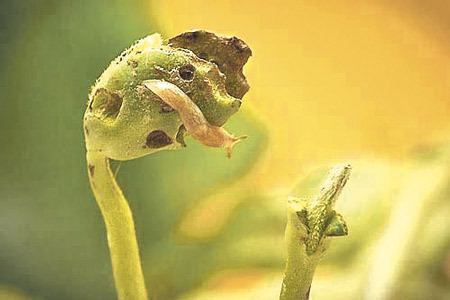 In their prime, slugs can significantly damage a seedling crop in just one or two days. They begin feeding as the crop emerges, so application timing, the amount of bait used, bait density and bait quality are crucial for successful treatment. The kill rate of pellets depends on the attractiveness and quality of the carrier, weather conditions and the toxicant level of the bait. If the carrier material is not attractive and palatable to the slugs, they may refuse the bait or only eat a sublethal dose from which they can recover, according to the report. The OSU summit found it is unlikely more toxic pesticides will enter the market because of harmful consequences for other species. Whatever you do use, however, stay away from salt to destroy slugs, as it will increase soil salinity. In Oregon and Washington, slug control is a year-round issue for many crops and no-till operations. The Pest Management Handbooks recommends laying out bait early if slug activity is apparent – and it may be best to bait for slugs before you work the soil (particularly if tillage is shallow and light). In broadleaf crops, slugs feed on seedlings, destroying tender growing points. Using slug bait in these crops is most important at planting (if slugs are active) or just before seedlings emerge, when they are most vulnerable. Preventive treatments are advisable on fields with histories of slug damage or in no-till situations. Slugs favor seedlings and plants with succulent foliage, so it’s important to pay closer attention to your basil, beans, cabbage, dahlia, delphinium, hosta, lettuce, marigolds and many other vegetable plants. They are serious pests of ripening fruits that are close to the ground, like strawberries and tomatoes. If growers would prefer not to use chemical baits, materials like salt-impregnated plastic strips and copper strips can provide small-scale barriers which are good for a few weeks. It is believed copper barriers work because the copper reacts with the slime slugs secrete, causing a disruption in their nervous system similar to an electric shock. Slug populations can also be reduced by tillage. Plows, discs and rototillers destroy slugs and their paths, dry out soil and remove plant food for slugs. The University of California (UC) IPM Program suggests switching from sprinkler irrigation to drip irrigation to reduce humidity and moist surfaces, making the habitat less favorable for slugs. Irrigating closer to sunrise will reduce the amount of time that foliage and the ground are moist. They also note solarizing the soil (using a clear plastic tarp and the sun’s heat) is a good way to kill eggs in raised beds. Hand-picking can be an effective way of removing slugs if done thoroughly on a regular basis. Plants with highly scented foliage, such as lavender, rosemary, sage, hydrangea, California poppy, nasturtium and lantana tend not to be favored by these slimy pests, so planting some of these near your cash crops may help keep them away. The UC IPM Program also noted some growers use beer-baited traps buried at ground level to catch and drown slugs that fall into them. The fermented product attracts these pests, so you could also use a sugar-water and yeast mixture instead of beer. Planning ahead on how to deal with slimy pests like slugs and snails can save you a lot of frustration in the early weeks of your growing season. Being vigilant can truly make a difference when it comes time to bring in your crops.